Jules Bergman, who extensively covered the space race for ABC News, announced Gagarin’s success to the American public in a scratchy, black-and-white TV report. By the time Gagarin was slipping the surly bonds of gravity, the world’s two remaining superpowers had already been running the so-called space race for several years. The Soviets were the first to launch a satellite, Sputnik, and the first to launch a living being, a dog named Laika, into space in 1957. Now they sent a human into the cosmos. Gagarin’s flight was a pivotal moment in the ongoing competition between the U.S. and USSR. The nations’ ambitions were as much based on scientific curiosity as they were national security, and both countries initiated or expanded massive investments during this period, including the development of technologies that impact our lives daily. If not for the erstwhile competition between two 20th-century superpowers, you may not have that computer in your pocket; the earliest precursors to the modern microchip were developed by Texas Instruments with funding from NASA’s Apollo program. The competition also spurred American investments in education, particularly in science and engineering, which federal officials believed lagged sorely behind the Soviet model. Funding mechanisms for science and education, like the National Science Foundation, were invented or strengthened during this time, generating ways of thinking about education that continue to this day. It all started with Sputnik. The first orbiting satellite, it is unerringly described as a beeping, beach ball-sized harbinger of history. The entry of Sputnik, Russian for “companion,” into space marked the explosive beginning of a new phase of the Cold War. For many, that started in the scattered classrooms and schoolhouses across the U.S., schools which previously had seen little direction from above. Many essential technologies of modern life, including the Internet, owe their early development to the accelerated pace of applied research triggered by Sputnik. Rebecca Miller, then a Ph.D. student attending the conference, noted the permanence of the changes to education: “Decades after Sputnik burned in the atmosphere, we’re still talking about science education as a means of security,” Miller said. After Sputnik, the Cold War competition was extending into almost every aspect of American life, including the classroom. 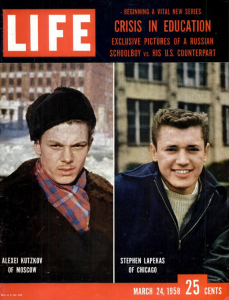 In a five-part series, for example, LIFE magazine examined what it considered the failings of the U.S. educational system in comparison to the Soviets. “It was just a time of incredible intensity and attention to science,” Dr. Shirley Malcolm, an ecologist and student in the late ‘50s, told the New York Times in 2007. With the Soviets claiming the first manned spaceflight, the drive to create a generation of scientists and engineers intensified even further. Among other programs, the Nation Science Foundation (NSF) saw dramatic changes to its mission during the era. In the two decades after Sputnik soared into orbit, the NSF contributed $500 million for teacher and classroom development. Steven Rissing, now a biology professor at the Ohio State University, was still a student during the space race. Indeed, while Congress may have been hesitant to expand the federal role in research and education before, the investments seemed inevitable, even vital, after the Soviets made their move toward the stars. “By connecting the quality of scientific training to the survival of the nation, NSF was able to increase its fellowships budget by more than 100% immediately after Sputnik,” according to research from Clemson University. From 1958 to 1959, the federal budget for NSF fellowships nearly tripled, and the number of fellowship awards more than doubled. For presenting academic subject matter through such media. Furthermore, the act infused more than a billion dollars into science education, and ushered the arrival of early ed tech, like overhead projectors and lab kits, into more U.S. classrooms, according to NPR. Even NASA’s Jet Propulsion Laboratory credits many of the items we rely on today, everything from dust busters and baby formula to camera phones, laptops, and the computer mouse, to the frenzied scientific focus of the 1960s. Gagarin’s 108-minute flight reignited the national rivalry, and the Americans were eager to respond. The U.S. had initiated its space program, NASA, in 1958 in part as a response to the Soviet launch of Sputnik, along with the National Defense Education Act. The small silver orb, visible to the human eye on a clear day, put space policy — and the educational needs that went with it — on center stage. So did its successor, the pug-nosed pilot from Klushino, Russia. The Soviets’ mounting success continued to compel swift changes in American policy. Recalling the event of Gagarin’s flight, Charles Duke, who later commanded the first Moon landing from Houston and touched down himself in 1972, said that despite the ongoing tensions, Gagarin’s success was a catalyst for the Americans. Only about a month after Gagarin’s launch, Alan Shepard become the first American astronaut in space, and the American advancements continued apace. Boris Chertok, a Russian engineer responsible for the control systems of the Soviet space program, pointedly connected Gagarin to America’s eventual landing on the Moon in 1969. The Americans had done it, sent human not only into space, but to the Moon and back — and all before the decade was out. Old Glory’s arrival on the Moon signaled a much-desired American victory in the race, but also a change in how the nation thought of science and technology education and the use of technology in the learning of any subject. He may not have known it when he let loose his hearty “Let’s go!” but Gagarin, the first person in space, had a hand in the modernization of American education, a legacy we recall today. Looking to connect the space race, its history, and its technological advancements with your class? Check out the resources below, including videos, lesson guides, and useful primary-source documents.